Two 55-foot by 9-foot murals depicting vibrant ocean scenes were painted on the exterior of two classroom buildings by legendary mural artist Tom Plonka. SAN DIEGO, CA, November 16, 2017 /24-7PressRelease/ — Jackson Design and Remodeling teamed up with Miles Himmel and the Larry Himmel Neighborhood Foundation for a unique project to spread smiles at the Riley Special Day School in Clairemont. Two 55-foot by 9-foot murals depicting vibrant ocean scenes were painted on the exterior of two classroom buildings by legendary mural artist Tom Plonka. At a special ceremony at the school, Riley Special Day School students and administrators gathered to thank Miles Himmel and the Larry Himmel Neighborhood Foundation and JDR President and CEO Todd Jackson who donated the funds for the project. “We are forever grateful to JDR for their incredible generosity,” said Riley Special Day School Principal Pamela Ann Busch. “These beautiful murals have totally transformed the way our school feels and have brought hope for the future to our students.” Riley students have social/emotional/behavioral needs that require a small, specialized setting that provides them intense, individualized support in academics and emotional well-being. Larry Himmel, the popular San Diego anchorman, was a loyal client and friend of JDR before he passed away. When the Himmel family home was destroyed in the 2007 San Diego fires, JDR designed and built them a new home. As a personal gesture because the Himmels had lost so much, Todd Jackson decided to hire artist Tom Plonka to surprise the then teenager Miles with an original San Diego Chargers and Chicago Cubs mural in his bedroom. The whole family loved the results and Miles, a huge sports fan, was thrilled. The mural became a treasured childhood memory. 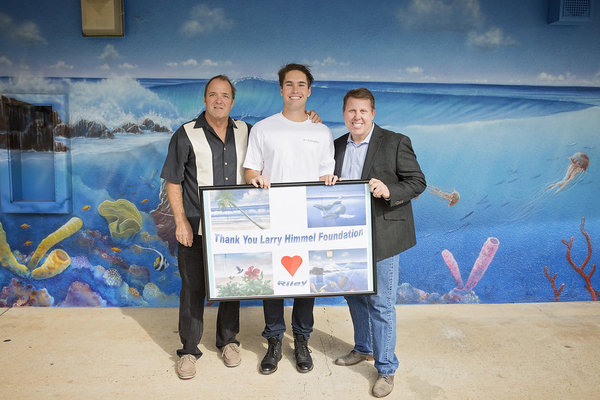 After Larry Himmel’s passing, Miles set up the Larry Himmel Neighborhood Foundation in his father’s honor. The foundation supports many worthy causes across San Diego County. It was Miles’ idea to create the murals at Riley Special Day School and he immediately called Todd Jackson to make it happen.